NHL.com's homepage has continued to try and appeal to its followers and fans with various puns on players names to introduce various highlights reels, weekly blogs by their staff, various user driven polls etc. However, today's poll may have strayed a little too far off topic for some. A poll focusing on possible Valentine's Day related names, due to an association with some kind symbol associated with the holiday in the name of various NHL players. The poll put Rod Brind'Amour, Guy Lafleur, Ben Lovejoy, Barry Melrose, and Chris Valentine in a battle for the title "the NHL's softest last name". 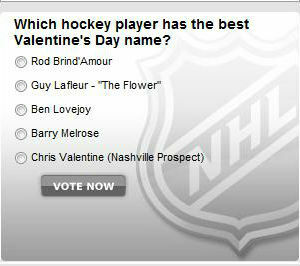 My personal vote would go to Guy Lafleur, a legend for sure, but probably a name you could get a way with whispering to your special someone and not get in trouble for bringing up hockey on a date for the umpteenth time. 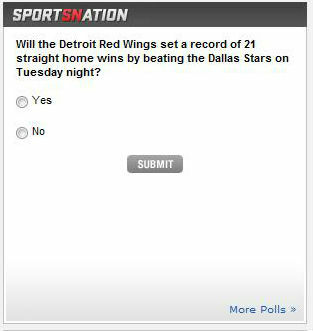 Meanwhile, over on ESPN.com, they have a poll that covers a topic of much greater appeal and importance, the Red Wings bid for a record breaking 21st straight home win.